Motor oil is designed to circulate through gasoline and diesel engines. It separates metal parts, cools hot metal surfaces, reduces friction, keeps engine parts clean and controls rust and corrosion. Motor oil is made up of base oil and additives. Prior to the 1930’s, there was just base oil. Base oil in good motor oil is refined from virgin crude oil or re-refined base oil obtained from used motor oil. Some motor oils are made from cleaned used motor oil but those are poor quality oils. Base oil may also be synthetic hydrocarbons or a class that is synthetically derived from a petroleum crude base. Motor oil works in engines by allowing piston rings to slide on a film of oil and crankshaft bearings to float in a cushion of high-pressure oil. It also works by protecting metal surfaces with chemical coatings to prevent rust and corrosion and allay wear where the oil film is thin. Classic Car Motor Oil (CCMO) came to the aid of vintage engines in 2007 as a collaboration between the DA Lubricant Company of Indiana and the Indiana Region of the Classic Car Club of America (CCCA). It has the imprimatur of the CCCA. There began to be some camshaft failures in the mid-1990’s when API-SJ oil came out in 1997 with about 1090 ppm zinc (mostly ZDDP). The preceding oil was API-SH with about 1300 ppm zinc in 1994. It takes around 1200 or more ppm zinc to protect the camshaft in break-in of flat tappet engines. The camshaft failure problem became epidemic when API-SM oil came out in 2004 with about 870 ppm zinc. There was little warning of the remarkable diminution of zinc over time. Zinc ppm in the 1980’s was over 1600 ppm. Classic Car Motor Oil is about 80% base oil (petroleum), 11% viscosity modifiers, and 9% performance additives. The viscosity modifiers (VM) are also called viscosity index improvers (VII). They are long-chain polymers which keep the viscosity up with increasing temperature giving CCMO a strong viscosity index (VI) of 135-40 as compared to 100 for standard petroleum motor oil and 150 for synthetic oil. VI is a measure of how much the oil thins with increased temperature. Classic Car Motor Oil uses the best quality viscosity index improvers and they are an expensive part of the additive package. Cheaper, poorer quality viscosity modifiers lead to lower oil pressure and deteriorating oil pressure over time. The shear stability index (SSI) of CCMO is 24 vs. the mid-thirties for SN Plus oil. The 24 means that in the test to determine shear or breakage of the VM polymers 24% is sheared. The VII polymers align with flow under high load in tight tolerance situations such as in modern engines with their very smooth, close tolerances and high quality metallurgy. This thins the oil and decreases inertial drag and is called reversible oil thinning. Decrease in inertial drag is a major factor in the increasingly less viscous motor oil for modern engines. Less inertial drag means better fuel mileage to help meet the government CAFE standards. Synthetic oil is necessary to obtain the low “W”, to zero in some cases, in the SAE weights for modern cars. The performance additives in CCMO include detergents, which are engine cleaners and acid neutralizers, as well as dispersants which suspend deposit-causing materials. There are also excellent rust and corrosion inhibitors and anti-wear agents. Cold flow improvers keep oil from being waxy and liquid for cold weather starts. Oxidation inhibitors are present as well. Oxidized oil can thicken to the point of engine damage. Classic Car Motor Oil has a stronger detergent-dispersant package than most automotive motor oils. This is particularly important in a vintage engine oil since those engines have a propensity to run short cycles and not burn off water and gasoline in the motor oil. There is also more blow-by (past the piston rings) of combustion products into the oil in the crankcases of these engines of all variety of mechanical conditions. Even after a proper rebuild the metallurgy and tolerances are nothing like modern engines. The sulfuric acid and nitric acid products of combustion must be neutralized to minimize metal corrosion. An oil filter, preferably a full flow, is quite important but not essential to engine health. Detergent oil should be used in spite of no oil filter. Detergent oil should not be used in an engine previously using non-detergent oil. Zinc dialkyldithiophosphate (ZDDP) is the preponderance of zinc in Classic Car Motor Oil. This chemical was invented by Lubrizol in the early 1940’s to stabilize bearing corrosion when harder bearings than babbit came into use. It was found that it was a very good antioxidant and anti-wear agent. The range of ZDDP in CCMO is 1335-1632 ppm with an average of 1484 ppm. The current SN Plus motor oil has a maximum of 800 ppm phosphorous (about 870 ppm zinc). ZDDP chemically reacts with metals forming a sacrificial protective layer, which wears rather than the metal. This is important where heavy loads cause the oil film to break down or where reversible oil thinning occurs because of stretching out of the VII polymers. The heavy loads most famously occur at the camshaft lobe – lifter interface. They are also present at the piston ring – cylinder wall interface, rod and main bearings, and piston pins. No one can pinpoint just how much ZDDP is enough to protect these vulnerable areas, but probably 1200 ppm zinc will work. Remember, however, zinc dialkyldithiophosphate is sacrificial and more is better, up to a point. When phosphorous reaches 2000 ppm (about 2180 ppm zinc) iron can be damaged. ZDDP also is an excellent antioxidant and anticorrosive agent. ZDDP and other additives, should not be placed into motor oil by the consumer. The chemically balanced, well thought out additive package designed by the oil manufacturer is disturbed perhaps with detriment to the engine. In the case of ZDDP there is no way to know the final ppm. It may be too much and be harmful. Modern engine oil is in a state of flux. The current motor oil is SN Plus with the “plus” added in November, 2017. The SN formula was promulgated by the International Lubricant Standardization and Approval Committee (ILSAC) in 2010 and known as ILSAC-5. ILSAC is made up of people from original equipment manufacturers (OEM), oil additive companies and oil companies. The classification system (SM, SL, etc) is an American Petroleum Institute (API) one. API is the largest trade organization for the oil and natural gas industry. ILSAC-6 is projected for 2020. OEM’s including the Europeans have come out with specifications for their own engines which make the number of types of motor oil continue to expand. The goals of ILSAC-6 are fuel economy to meet CAFE standards, wear protection, aeration control, oxidation resistance, emissions control, turbocharger deposit control, low-speed pre-ignition (LSPI) protection in engines with direct-to-combustion chamber injection, and durability. In these modern engines with high quality metallurgy, tight tolerances and high technology, the motor oil acts also as hydraulic fluid in engines with cam phasing, variable valve timing and cylinder deactivation. These features are for fuel efficiency and lowered emissions. Oil change intervals are long in current OEM recommendations. This is possible in spite of their oils having less detergent than CCMO because of high technology and little blow by. This is also possible because synthetic oil holds its viscosity better with time in use than standard petroleum oil; however, CCMO holds its viscosity in comparable fashion with the recommended times in use. Note the VI and SSI previously mentioned. 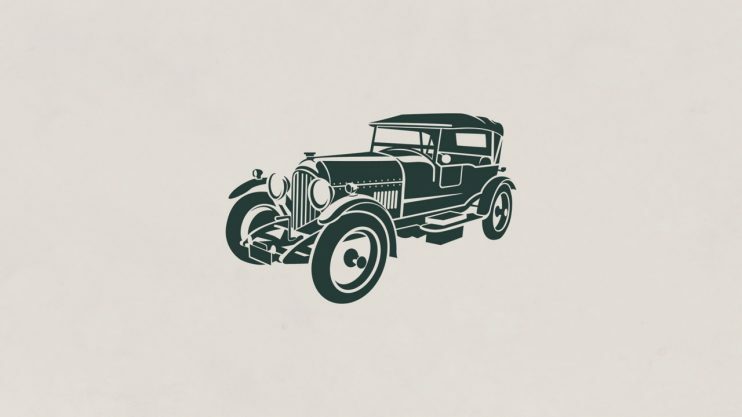 For vintage engines DA recommends oil change at six months for a car stored outside and one year or 3,000 miles, which ever is first, for a car stored inside. DA considers shelf life to be three years. Multigrade motor oil should be used instead of monograde. There is no advantage to monograde. A great deal of wear occurs on cold starts. With a multigrade the thinner oil gets to the moving parts more quickly. The top viscosity of multi-grade motor oil such as SAE 40 in SAE 15W/40 is measured whether multigrade or monograde at 100 degrees C. Each oil then must be SAE 40. Beyond 100 degrees C the multigrade is thicker than monograde. The multigrade provides protection better in high temperature areas like the ring-cylinder wall interface (ZDDP is very helpful here, as well). The multigrade, being a little thicker, gets thrown less into the combustion chamber to be burned. It also forms a better ring-cylinder wall seal for better compression. Multigrade stays on metal parts as well as monograde while the engine sits idle. 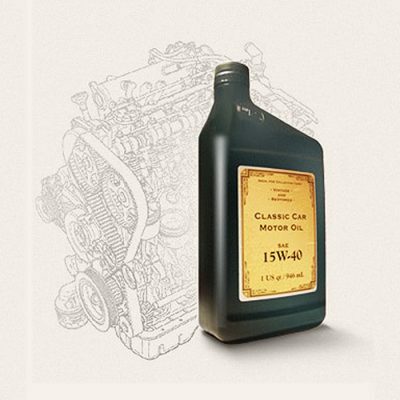 Classic Car Motor Oil is the optimal oil for the vintage engine. It maintains its viscosity very well with engine temperatures and in most cases better over time than petroleum based oils and comparable with modern car synthetic oils with the recommended oil change intervals. The ZDDP optimal level protects areas where there is a token oil film. The cam-lifter interface is protected better than with modern car oil. The higher level of detergents (1.44% vs. 0.92% in modern motor oil) and dispersants is best in vintage engines with more blow-by and frequent short cycles. The anti-corrosion, including anti-rust, package is a strong one. There is no need or indication for synthetic oil in CCMO. Synthetic oil is a little finer grain and a little slicker than petroleum based oil and optimal for the close, smooth tolerances in modern engines. It will also withstand extremes of low or high temperature better than petroleum oil, not needed in the vintage engine, but helpful in turbocharged and racing engines. Synthetic oil absorbs more water than petroleum oil – not an ideal quality in engines that tend to set a lot and often run short cycles. The expenses of full synthetic oil may be four times that of petroleum. When all factors are considered, there is no valid reason to use synthetic oil in Classic Car Motor Oil or the vintage engine. The modern engine oil goals of fuel economy to meet CAFE standards, emission control, turbocharger deposit control and LSPI control are not in synchronization with vintage engines and Classic Car Motor Oil whose goals are minimal wear and minimal corrosion in concert with a clean engine. Classic Car Motor Oil is not recommended for vehicles that have catalytic convertors since the phosphorous will coat the interior and make the convertor increasingly less effective. It also, like other automotive motor oils, should not be used in air-cooled engines. Do your vintage engine a favor and use Classic Car Motor Oil. It is available only through the Indiana Region of the Classic Car Club of America at www.classiccarmotoroil.com or 317-225-0040.